Thanksgiving is my favorite holiday. Ask anyone. I LOVE it. This is a holiday in which there is no perfect present pressure, no religious overtones, just a celebration of the three f’s—Family, friends and food. It’s THE day to say a heartfelt “Thank You” to the people who make my life so wondrous and a nod to those who have passed yet left an indelible mark on my life. So my next few posts will be all about my favorite day and ways in which to fill your table with a feast of flavors. I don’t want to sound arrogant, I prefer confident, but I make a splendid meal. And each year the meal expands: intriguing flavors and non-Thanksgiving items. Yet there will always be the standard bearers of a Lyness/Rizvi Thanksgiving and the next posts will give you the recipes for these dishes. 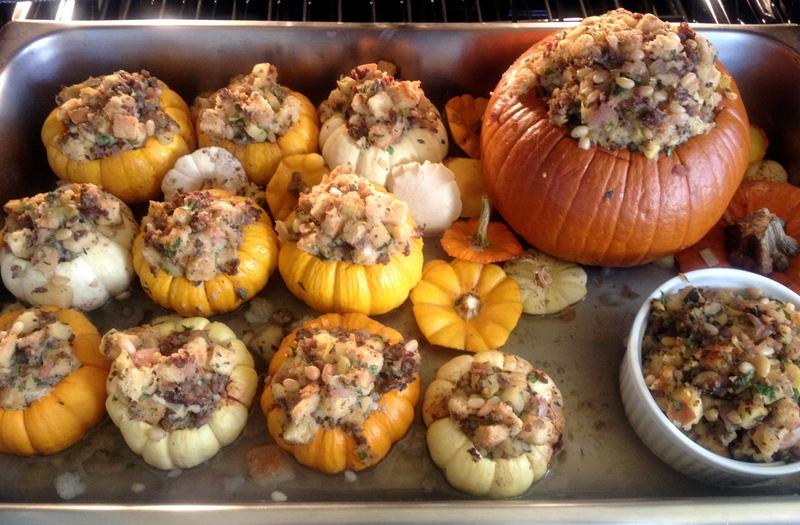 There are a few standards at my Thanksgiving table and perhaps everyone’s favorite are the stuffed mini pumpkins. I tried to change these up and was met with cries of protest. The reason I am writing this as the first recipe is so that you can plan on buying your mini pumpkins when they are in the stores. Trust me, as Thanksgiving approaches the minis become scarce. Yet worry not if this where to happen. A big pumpkin can be stuffed with the filling and none will be the wiser. This recipe comes from November 1, 1999 New York Magazine of Waldy Malouf. I have added and subtracted over the thirteen years. 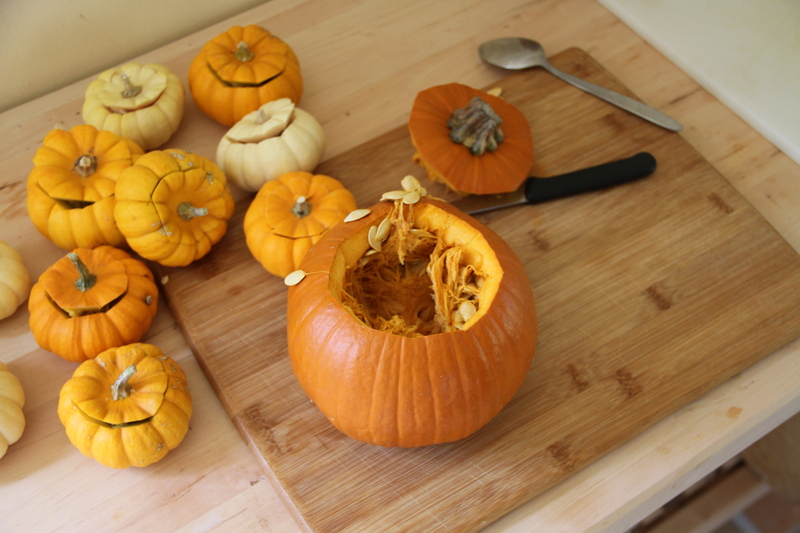 Cut and clean and mini pumpkins as you would a regular pumpkin. Scrape out all the stringing stuff. Place minis in a baking pan. Put a sliver of butter in the bowl of each mini pumpkin, sprinkle cinnamon and just a drizzle of maple syrup. 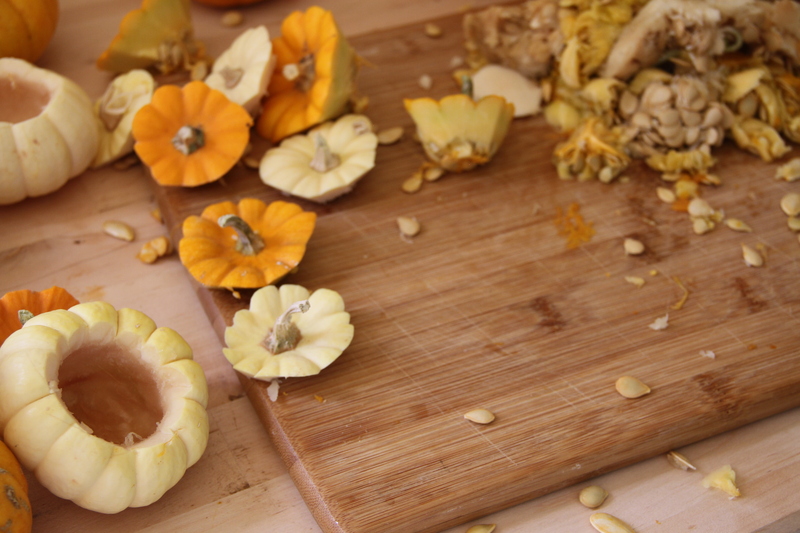 Pour enough water in the bottom of the baking dish (1-2 cups) place pumpkin tops in the baking dish wherever they’ll fit. Place in a 350 degree oven and bake for about 30 minutes. If the water evaporates add a bit more. Remove from oven. I keep them in the same baking pan in a cool part of the kitchen or pantry overnight. They don’t go bad. The Stuffing day before or day of. Heat a large sauté pan over high heat. Add sausage meat, breaking it up into small pieces as it browns. Once the meat is browned add onions, garlic, shallots. Stir in butter, and half the chopped herbs and lower heat to medium. Cook for two minutes. Add apples and celery and cook for about 4 minutes so that they start to soften. Add wine and cider. Stir well. Crank the heat up and boil until the liquid is almost gone. Taste to see if there is enough sage. If not sprinkle a little poultry seasoning. While the mixture cooks. Grab a large bowl add the bread stuffing to the bowl. When the liquid is evaporated add sausage to bread stuffing. Add the rest of the fresh herbs. Taste and adjust seasonings—salt, pepper and poultry. Add 1-2 cups of chicken stock to moisten bread crumbs. Add beaten egg mix thoroughly. 10. 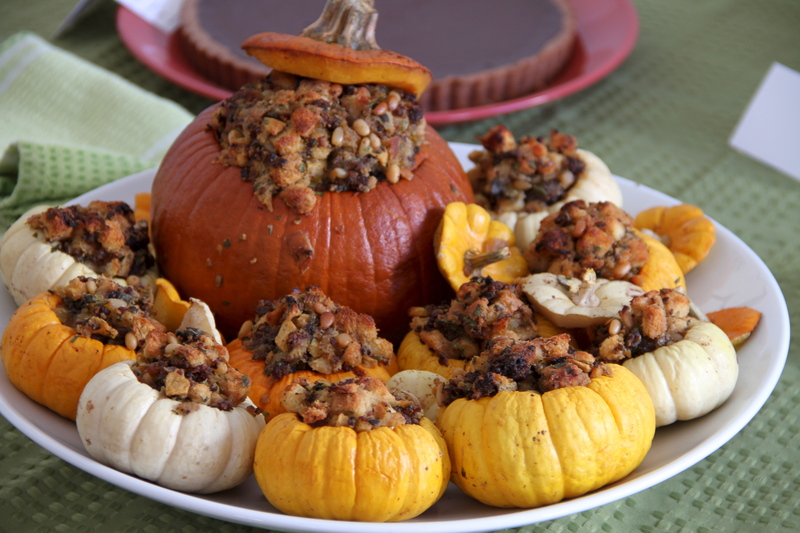 Fill each pumpkin with a generous amount of stuffing. 11. Bake for 35-45 minutes at 350. Or if making the day before, wrap and place in refrigerator. When baking the next day, bring them out for about half hour before you bake. Hooodes!! These are my FAVORITE!!!! These were beautiful and delicious at the FBLA meeting. Plus, stuffing is my favorite food. I can’t wait to make these for my family. I’m sure they will become a new tradition. Thank you for sharing the recipe. Thanks so much for the kind words. I think your family will love them.